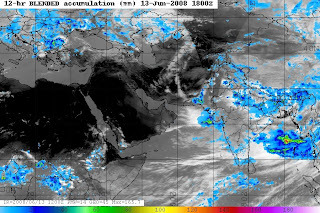 The monsoon in the sub continent has suddenly progressed fast and covered up most parts of northern India and touching Pakistan along the coast, sparing only the western region of Rajasthan and Punjab.It has reached the Pakistan border, both along the coast and in the northeast. This overall progress for the region is about 2 weeks ahead of schedule. The trend favors earlier than normal onset of the South West Monsoon over the central and northeast of Pakistan.This is the result of the unprecented low discussed in the last blog. Hence here today, the South West Monsoon is underway ahead of schedule over the Subcontinent. 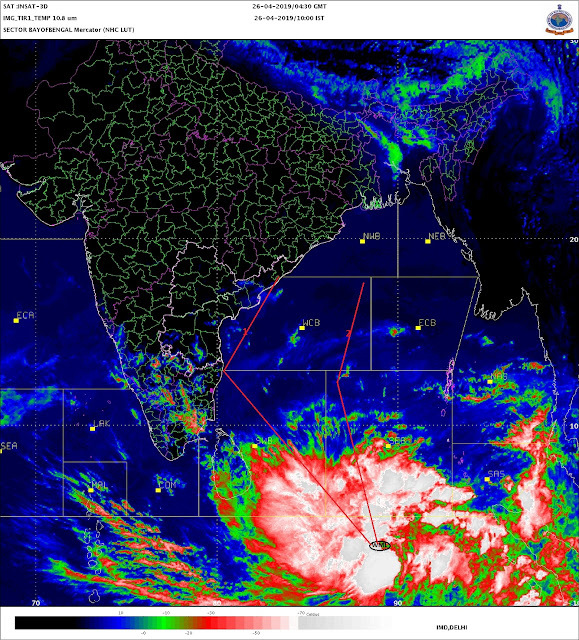 What is now lacking is any well-marked Monsoon low--over Bay of Bengal; or over the Arabian Sea. Rather, what we have is a upper low just over northern India. Persistent weak low pressure over northern India is shown by numerical forecasts to loiter for at least a few more days--this will uphold the pattern of scattered heavy falls over the open plains to the Himalaya foothills. This may lead to a "break monsoon " condition, which may not mean well at this early stage of the season.The trend favors earlier than normal onset of the South West Monsoon over the northern areas and northeast of Pakistan. Personally , I may not comment as to whether this is a steady trend or only a "jump" to be followed by pause or even "break monsoon". Thus, close observation, and anticipation, with respect to the next few days will be for a moderate monsoon low over the northern Bay. Such a low, preferrably a depression, would alter and likely boost overall rainfall over eastern and northeastern India.This would also give a momentum to the now much required rains in the interior areas of Maharashtra and overall central/south peninsula regions. Weak, ill-defined low pressure, aloft, over the Arabian Sea will continue the occurance of fa irly good rains along the Konkan coast and rain along the Gujarat coast for a day or two. "Rain shadowing" will keep most of the inland regions free of any major rain. Rainfall on 13th. June is shown in the image.Concentration is mainly in the belt running north to east and along Gujarat/Maharashtra coast. In some other related news, the monsoon rains have been exremely heavy in Hong Kong. On the 7th. of this month,the city Observatory recorded 145.5mm during the hour from 8am to 9a.m. the highest hourly rainfall since record began. From midnight until 6 p.m., 304.8mm of rain fell at the Observatory, the fifth highest daily rainfall record in June. Streets across Hong Kong were severely flooded, some roads were closed and some flights were delayed at the international airport. Mumbai cannot complain of getting disoriented by more than 100mm of rain in 24hrs !